In the last 40 years, America has become increasingly residentially segregated by income. In 1970, two-thirds of families in large metropolitan areas lived in middle-class, mixed income neighborhoods—neighborhoods where the median income was close to that of the region as a whole. Today, only 42 percent of families live in such neighborhoods. Mixed-income neighborhoods, and with them mixed income schools and playgrounds, have been replaced by a rapidly growing number of neighborhoods that are either very poor or very affluent. Economic segregation is the result of many factors, including inequality in family and household resources, differences in individual preferences, housing and land-use policies, and, in some cases, discrimination by landlords or real estate agents. Growing income and wealth inequality, in particular, have contributed significantly of the rapid increase in income segregation over the last four decades. The widening of the income distribution has exacerbated differences in families’ ability to pay for housing, polarizing neighborhoods by income and slowly eliminating mixed-income communities. One obvious negative consequence of economic segregation is that it concentrates poverty. In the absence of mixed-income neighborhoods, the poor can find housing only in poor neighborhoods. Moreover, in many large metropolitan areas poor neighborhoods cover very large areas: Chicago’s South and West sides, South Central Los Angeles, North Philadelphia, central Detroit, or Brooklyn’s East New York. In these places, poverty rates are extremely high, average educational attainment is low, and a host of social problems, such as street-level drug activity and school violence, are on display in the news and popular media. And these neighborhoods are no longer confined to urban areas; concentrated poverty in the suburbs has grown sharply as well. Such neighborhoods, home to those whom William Julius Wilson famously named “the truly disadvantaged,” are hard places to raise children, with scarce opportunities for social mobility. It is easy to think of neighborhoods like these as the primary “problem” that results from economic segregation. But economic segregation concentrates not only poverty, but also affluence. The growth in the number of very poor neighborhoods in America over the last 40 years has been mirrored by a concurrent increase in the number of very affluent neighborhoods, a pattern that is evident in maps like the one below (and others here). 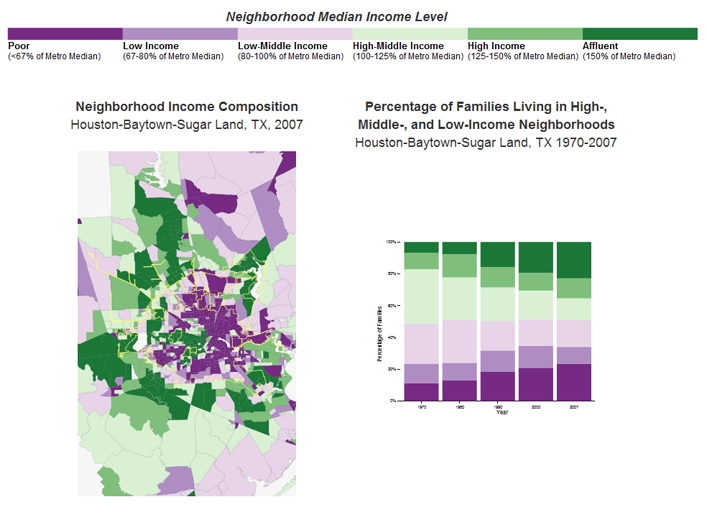 In 1970, only 7 percent of families in the Houston metropolitan area lived in affluent neighborhoods—those with median incomes more than 50 percent higher than the median in the area; in 2007, almost a quarter of families lived in such neighborhoods. But is this cause for concern? After all, such neighborhoods are generally considered highly desirable, places where many people would like to live, if they could afford to do so. Think of urban neighborhoods like Manhattan’s Upper East Side, Chicago’s Gold Coast, and San Francisco’s Pacific Heights; seceded municipalities within large cities, such as Highland Park, TX (in Dallas) and Piedmont, CA (in Oakland); or high-profile suburban communities within easy commuting distance of major cities, such as Scarsdale, NY and Palo Alto, CA. Although housing is very expensive in these places, and growing increasingly so, many affluent families are willing to pay to gain access to protected school systems, robust public services, and high-quality retail establishments. The growth of these communities—one in seven families now lives in such places, double the proportion in 1970—means that the affluent are increasingly isolated not only from the poor, but also from the middle-class. Indeed, the segregation of affluence is higher than the segregation of poverty: families in the top 10 percent of the income distribution are more isolated from families in the bottom 90 percent than are families in the bottom 10 percent from those in the top 90 percent. 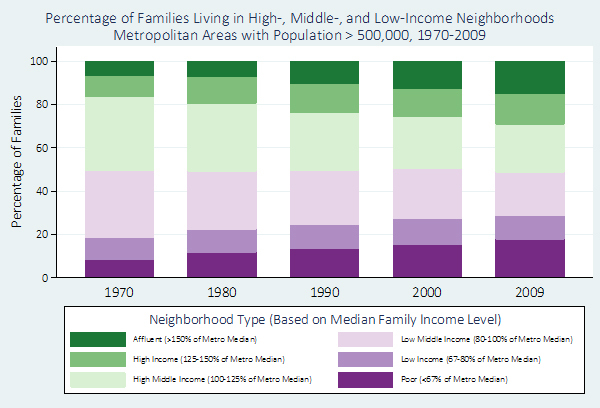 Moreover, affluent neighborhoods are increasingly geographically distant from poor and middle class neighborhoods. This aspect of economic segregation—the concentration of families with abundant resources in economically homogenous neighborhoods—deserves more attention. These patterns concentrate wealth, human and social capital, and political influence in places far from the poor, and increasingly far from the middle class as well. As a result, any self-interested investment the rich make in their own communities has little chance of “spilling over” to benefit middle- and low-income families. In addition, it is increasingly unlikely that high-income families interact with middle- and low-income families, eroding some of the social empathy that might lead to support for broader public investment in social programs to help the poor and middle class. These processes pack a one-two punch that may do as much to harm the poor as does the concentration of poverty itself. Why, given its potential consequences, do we not pay more attention to the isolation of the rich? Social scientists, journalists, and policymakers focus on poor neighborhoods in part because that is where the (visible) social problems are; in part because it is easier to study, report on, and intervene in poor places than in rich places; and in part because we routinely commit the outdated fallacy of assuming that concentrated social problems must have local causes. But neighborhoods are not islands. Poor neighborhoods may be shaped less by their residents than we think, and more by diffuse and often invisible decisions made by influential people living far away. Sean F. Reardon is the endowed Professor of Poverty and Inequality in Education at the Stanford Graduate School of Education and Director of the Stanford Interdisciplinary Doctoral Training Program in Quantitative Education Policy Analysis. Kendra Bischoff is an assistant professor of sociology at Cornell University. Spread the Wealth, or Spread the Wealthy?